The Phase 1 review of the Dominican Republic demonstrates their high level of commitment to the international standard for transparency and exchange of information for tax purposes. Generally, the legal and regulatory framework for the availability of information is in place. However, the Dominican Republic should ensure that an appropriate mechanism in put in place to ensure the ownership information for bearer shares is available in all cases. The Dominican Republic has sufficient access powers in the Tax Code for both domestic and exchange of information purposes and the right balance has been struck between rights and safeguards and accessing information. However, the complexity of the process for accessing banking information directly may unduly delay the exchange of banking information. At present, the network of information exchange mechanisms covers three jurisdictions, being their three main trading partners and the Dominican Republic is continuing to negotiate further agreements to extend their EOI network. 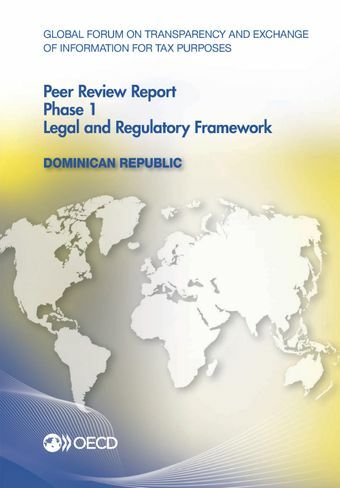 The response of the Dominican Republic to the recommendations in this report, as well as the application of the legal framework to the practices of its competent authority will be considered in detail in the Phase 2 Peer Review of the Dominican Republic which is scheduled for the fourth quarter of 2015. For further information on the exchange of information practice of the Dominican Republic and to read the full report click here.